Figure 1-11. - Isometric 45-degree squares, chamfers, and diagonals. Figure 1-12. 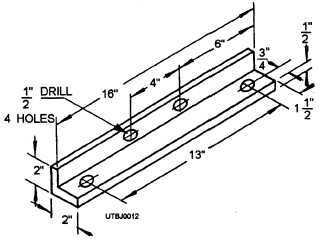 - Isometric drawing of a pipe hanger. The purpose of an isometric pipe layout is best served by a simplified dimensioning system. Because few dimensions are shown, draw accurately to scale, so the layout can be measured. 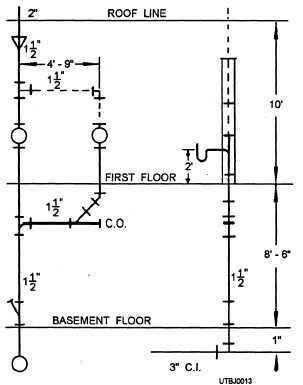 Practice dimensioning by redrawing the pipe diagram of figure 1-13 as an isometric pipe layout. Ensure the lengths are to scale, and dimension the pipe size accordingly. Also, make a list of fittings and pipe required (MTO).